Of course everyone already knows all about Prince, the Minneapolis-born megastar who arguably might be one of the best guitar players to ever grace the planet, but the Twin Cities area has also been home to many other famous guitar players who often fly under-the-radar. 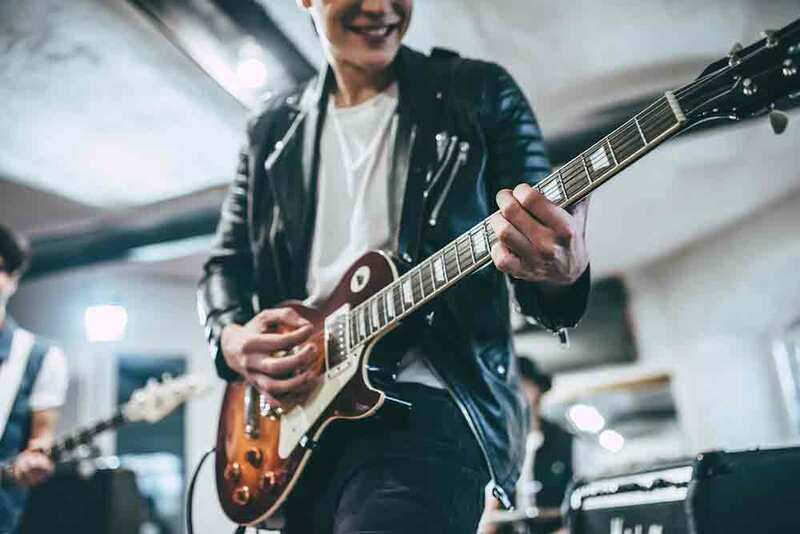 Whether you are just getting started with guitar lessons or are simply a Minnesota music history buff, it’s always fun to dive a little deeper into how players got their start, as well as learn how they're influenced. Here are five popular guitarists you might not know were born in either St. Paul or Minneapolis. Minneapolis native Bernie Leadon has most notably contributed to The Flying Burrito Brothers and the Eagles and specializes in playing lead guitar, acoustic guitar, banjo, and pedal steel guitar, among other instruments. Leadon also wrote or co-wrote several of the Eagles' best hits, including "Witchy Woman," "Earlybird," and "Train Leaves Here This Morning." The multi-talented Leadon was inducted into the Rock and Roll Hall of Fame with the Eagles in 1998. Article continues past the image. Chances are you've heard of Greenberg's most famous song, "Funkytown." The 1980 double-platinum mega hit topped the charts in 28 countries — a record that stood until 2005 — and was written and produced by the St. Paul-born guitarist for his band, Lipps Inc.
Greenberg is also a multi-instrumentalist and has carved out quite a career playing, recording and producing. He even does some web design between strums. Minneapolis-born Dan Wilson is best known for fronting the 1990s rock band Semisonic. He penned the band's classic hit, "Closing Time," which has become a late-night barroom standard. He also co-wrote "Not Ready to Make Nice" with The Dixie Chicks, and "Someone Like You" with Adele. Wilson has become a mainstay on the popular music scene and even has a couple of Grammys to his credit. In addition to songwriting and playing guitar, Wilson also produces music, is a visual artist, and plays bass, piano, pump organ and drums. Paul Westerberg hails from Minneapolis and is best known for fronting the 1980s garage punk band The Replacements. In addition to singing in the group, Westerberg also wrote songs and played guitar. Westerberg has also had quite the success as a solo artist, too. Some of his solo work has been featured in movies such as Singles, a flick he wrote and performed the entire score for, and television shows such Friends and Melrose Place. In 1964, The Trashmen had a hit with the song "Surfin’ Bird." It reached #4 on the Billboard charts and put the Midwest band — and Tony Andreason — on the map. Andreason played lead guitar and sang for the surf rock group from Minneapolis. Today, Andreason continues to play guitar in the Minneapolis bluegrass band, The Platte Valley Boys. Are You Interested in Becoming Part of the Local Music Scene? Minneapolis, St. Paul and the Twin Cities area has one of the most vibrant music scenes in the country, and some of the most successful ones started by taking guitar lessons in the area. In fact, some still do take guitar lessons so they can stay on top of their game. If you have dreams of making it big one day, it pays to go above and beyond to learn your instrument. But hey, making it big is tough, and sometimes you just want to learn how to play a song from your favorite band. Either way, if you want to get started with guitar, send us a message and we'll put you on the right track. This 10-step, straight-to-the-point guide shows you everything you need to play and sing songs on the ukulele. With these instructions, most people can start actually playing songs they want to play in less than a few hours. The book also contains next steps for getting as good as you probably ever need to be. All payments are processed by PayPal, helping to ensure the security of your personal information. The Approachable Music Project does not save any of your payment information! © 2018 by The Approachable Music Project. All Rights Reserved.